Caylen Wojcik takes aim at the 2013 Oregon Sniper Challenge. Photo courtesy of Terry Doi. Eagle Creek, Ore. –(Ammoland.com)- A .25 MOA, 800-yard cold bore shot was just one of the highlights of Caylen Wojcik’s win this weekend at the 2013 Oregon Sniper Challenge. 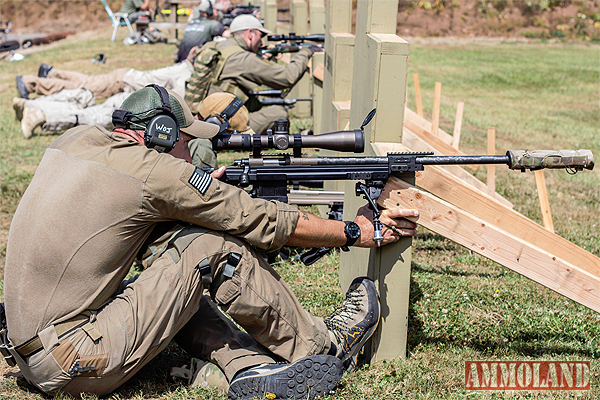 Competing against 49 highly trained shooters, with teams from Ireland, United States Army Special Operations, and SWAT, Caylen, the Director of Precision Rifle Training for Magpul Dynamics and a former USMC Scout/Sniper, landed a decisive victory finishing 74 points higher than the second place winner. And he did it using a latest technology carbon fiber-wrapped barrel from Proof Research.